To reflect the sublime beauty and the spirituality of this place that I love, I chose a variety of blue and green gemstones, blue zircon, London Blue topaz, green and blue Peruvian opals, moss aquamarine, apatite, fluorite and chrysocolla, and some beautifully faceted labradorite. Of course, the warm tones need to be represented too, so I chose sunstone and carnelian to use as complementary stones. Rugged looking copper and deerskin leather are mixed into the designs in all the right places, as well as some carefully chosen bits of antique copper chain. Many of the copper components I have made myself in order to achieve just the right balance of rustic patina and primitive texture. 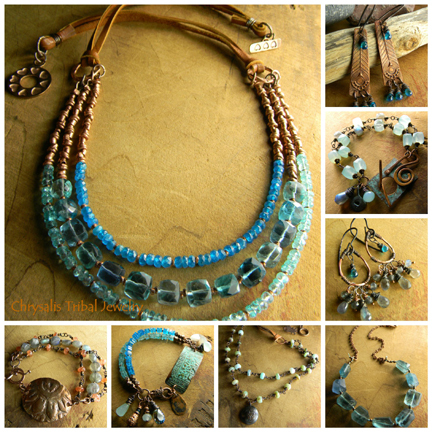 The result is a rich blend of colors and texture in my boho and slightly southwestern style, suitable to bear the name "Apostle Islands Collection". Available now in my web store.